Howlin' Wolf Records: SIX STRINGS: THE VIDEO DEAD: I think this movie tried to kill me. 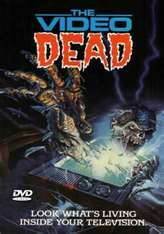 THE VIDEO DEAD: I think this movie tried to kill me. In THE VIDEO DEAD everything is dead. The story starts off promising then dies about ten minutes in without any hope of resuscitation. The acting was horribly eccentric and forced like bad community actors in a play written and directed by a five year old. I can't believe all these people were that bad as actors. They all had to have gone to Bad Acting Classes or something. Nobody can be that bad and not that many people all at once. It was more than a handsome old man such as myself could handle. I don't think the actors were intentionally trying to kill me with their poor acting skills but the director may have with all his awkward close ups capturing every forced unbelievable expression on their generic faces.